2016 Mom's Choice Awards Gold Medal Winner, Readers Favorite Gold Medal Winner and Readers Favorite 5 Star Review. Regina E. McCarthy, LCSW, is a Holistic Psychotherapist with a private practice in Elgin, IL. She received her undergraduate degree from Boston College, Boston, MA, and her master's in social work from Loyola University, Chicago, IL. She is a member of the National Association of Social Workers and the Wellness Institute, Issaquah, WA. She is an Advanced Heart-Centered Hypnotherapist®, an Integral Breathwork therapist, a Trim-Life® provider, and a Reiki Master. She is also a member of the SCBWI and the Independent Book Publishers Association. She lives with her husband and has three adult children and a cat named Bob. Courageous Gilbert the Groundhog is her first book. 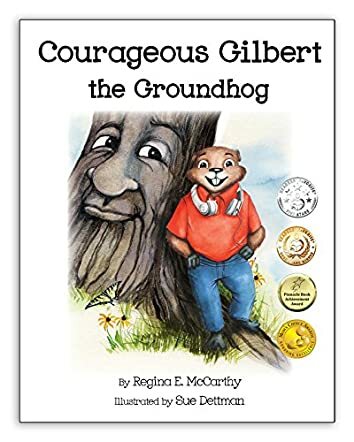 Courageous Gilbert the Groundhog by Regina E. McCarthy is an adorable storybook for children. Gilbert had many interests. He was a great collector of toy cars, action figures, and lots of rocks, and he also enjoyed listening to music. There were many things Gilbert didn't like - he did not like standing up in front of the class, he didn't like being made fun of when he sang, and he didn't like finding someone to sit with him for lunch. One day, while leaving school upset, he climbs an old oak tree. Readers see a friendship bond being developed between Gilbert and the old oak tree. The book conveys an excellent message to young readers and tells them the importance of deep breathing and that it is okay to express their feelings and emotions instead of hiding them. The concept shared by the author is excellent as it helps build confidence in children. The illustrations are bright and lively and give a good pace and movement to the scenes and the story. The breathing techniques mentioned in the book can be practiced to ease tension and anxiety, and will help children release their emotions and fears instead of holding them inside. It's an excellent book for interactive sessions in classrooms and school libraries, and can also be used for bedtime story-telling. Therapists, counselors, and educators can use the techniques in the book while working with kids. The book also speaks about the importance of mental health and the benefits of deep breathing.